It has been a while since I’ve been back to the Valiant Universe. And after reading Secret Weapons, I must say that I missed it. While this book focuses on a team, of sorts, that is comprised of only one Valiant character that I’m familiar with, and even though I’ve missed some big Valiant events and changes, I never felt lost or confused during my read. New readers to Valiant comics might not realize how easy it is to get into the universe. There have been very few Valiant books that I’ve read and felt that I was missing story. They for sure know how to tell a story to someone that has just picked up a book, but they mix that with enough connection to the rest of the universe that Valiant fans will find enough to appreciate in every title. And that’s one thing I’ve always found interesting about Valiant: their ability to world build without turning new reads away. Only four issues, this story should feel a bit thin, but it does not. The writing of Eric Heisserer is exceptional. He maintains a solid mixture of action and dialogue/character development. The art in the trade is familiar to the Valiant family, but the panel/page layouts feel better to me than I remember. Not that I’ve ever had an issue with Valiant page layouts, I just really like what Allen and Martin have done with a lot of the pages in this book. Lots of small panels juxtaposed against half/quarter page panels work to create an interesting flow, and random, jarring color shifts are a welcomed aspect to this book as well. What we have is a group of semi-heroes, all with less-than powers (one talks to birds, one manifests objects but can’t control what he manifests, and one can turn to stone but cannot move while doing so) that were holding up in a dorm/holding building of sorts when they get threatened. On the move to stay safe, the group, with help from Valiant stud Livewire, finds themselves plotting and battling for survival. The power of teamwork is definitely the major theme on display here. 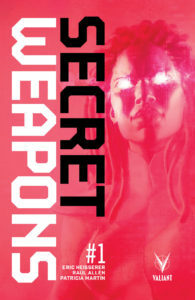 A fun book for those familiar with Valiant books or just cracking one open for the first time!